Lung cancer is the leading cause of cancer death in the United States. According to the National Cancer Institute, more than 200,000 patients were diagnosed with lung cancer and nearly 160,000 died from the disease in 2009. There are two major categories of lung cancer—small cell lung cancer (SCLC) and non-small cell lung cancer (NSCLC). Molecular imaging is playing an increasingly important role in the detection, diagnosis and treatment of NSCLC, which accounts for the majority of lung cancer cases. Molecular imaging is not typically used for SCLC. Treatment options for NSCLC include chemotherapy and radiation and if diagnosed early enough, surgery. Accurately identifying if the cancer has spread to other parts of the body is critical for determining treatment options for patients. What is molecular imaging and how does it help people with lung cancer? What molecular imaging technologies are used for lung cancer? Positron emission tomography (PET) scans and combination PET and computed tomography (CT) scans are routinely used to diagnose and treat non-small cell lung cancer (NSCLC). Depending on the course of treatment, non-small cell cancer patients may require several PET or PET/CT scans, including whole-body scans. How is PET used for lung cancer? What are the advantages of PET for people with lung cancer? Recent studies show that molecular imaging technologies change the course of treatment for as many as 64 percent of lung cancer patients. Patient with lung adenocarcinoma in right lower lobe, as depicted by the arrow. (A) CT scan (B) 11C-4DST PET (C) 18F-FDG PET (D) Ki-67 immunohistochemistry. 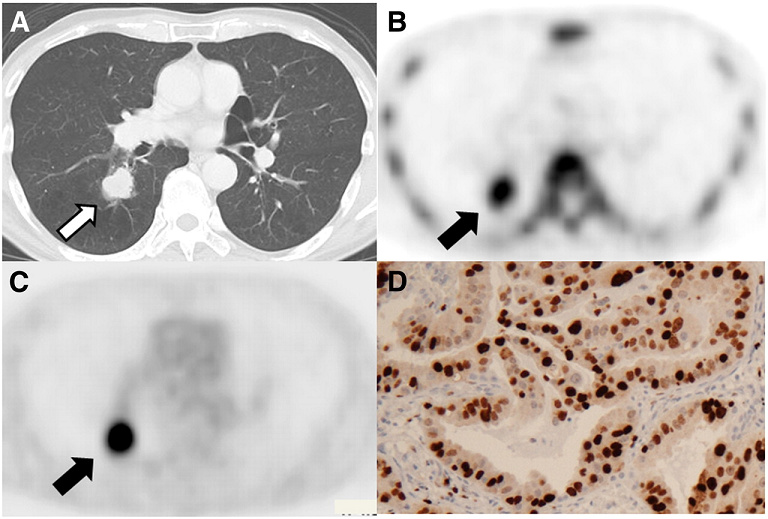 B and C depict radioactivity accumulation in lung lesions. D shows positive nuclei (colored brown) with an estimated proliferation rate of 81%. PET and PET-CT studies to diagnose, stage, re-stage or identify a recurrence of non-small cell lung cancer are covered by Medicare and Medicaid. Major insurance companies and health maintenance organizations also provide coverage for PET-CT studies for NSCLC. Check with your insurance company for specific information on your plan. What is the future of molecular imaging and lung cancer? Researchers are making exciting advances in understanding the molecular and genetic mechanisms that play a role in the development of lung cancer. Promising areas of research include the development of novel reporter-gene imaging systems, which involve engineering genes that are able to adhere to specific cells so they may be tracked with molecular imaging technologies. In addition, scientists are working on ways to image molecular markers and biological pathways that are able to provide insight into the progression of lung disease and its response to treatment.